Like many people, I value opera as much for the spectacle as the artistry. Canadian Opera Company, obviously recognizing this fanciful desire in many of its devotees, has for the last few years thrown a gala competition in the fall to help choose the new members of its Ensemble Studio, aka Canada’s most glamorous internship. 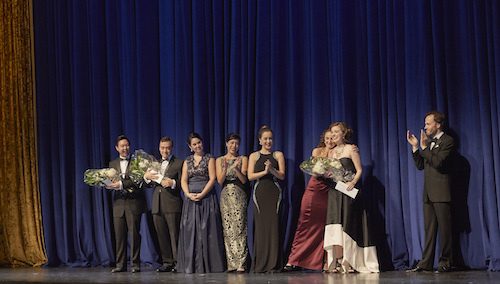 The Centre Stage Gala gives audience members a little bit of opera’s inside baseball, letting patrons choose early favorites and savor the pleasure of following them as they launch their careers. The gala features a lavish cocktail hour, followed by the competition — another sampler of pleasures, though auditory rather than gustatory. After the winners are chosen, the Canadian Opera Company hosts an intimate dinner on the stage of the Four Seasons Centre itself, at which a small number of ardent (and lucky!) supporters may enjoy dinner by Chef David Lee of Nota Bene and gaze into the breadth of seating their artistic heroes at COC address during performances. But what’s it like to compete for operatic honors in front of a crowd? Mooney on Theatre spoke with the 2016 Centre Stage winner, mezzo-soprano Simone McIntosh about her experiences last year. Mooney on Theatre: Exciting events can sometimes become a blur in retrospect. What’s your clearest memory of last year’s competition? Simone McIntosh: Right before I went on for the open round, I was standing next to the stage manager and just jumping up and down. I said out loud: “This is the best part.” I walked onstage and I just had such a wonderful time, and singing in the Four Seasons Centre was an amazing treat. Honestly, I had the time of my life. MoT: Did you like what The Hudson’s Bay Company dressed you in for the competition? MoT: There was a lot of jumping up and down, sounds like. SI: It was all pretty amazing. MoT: And how is working with the Ensemble Studio? SI: I go to work every day with a smile on my face thinking “I can’t believe I get paid for this!” I’m learning so much and I’m surrounded by people who are supportive and brilliant. I get to see the successes and the challenges and learn from everything. The staff is amazing across the board, and everyone is so kind. I don’t know if that’s usual, really, but I feel very privileged to be here. MoT: Do you have any advice for the 2017 Finalists? SI: Get out there and sing! Remember why you love what you do, and just have fun with it. I didn’t treat it as much as a competition, more as an opportunity to perform in a fantastic place and meet great people. We had a wonderful vibe last year. Tickets for the cocktail hour and competition performance are $100 and can be purchased online or by calling the box office. Tickets for the post-competition dinner are $1500 per plate, and can be purchased by calling 416-363-5801.